Freezing helps to reduce the astringency of the sea buckthorn , or seaberries. Picking the berries is difficult due to thorns among the berries. Whole branches may be picked and frozen, after which the berries can be shaken off, but this method lowers production in future years. Leaves for high vitamin C tea should be picked from the male plants so as not to reduce leaf area on the female plants. Prune to train branches, promote growth and open the plant to allow light into the center and to make picking the berries easier. Remove overlapping branches, and long branches should be cut to encourage development of lateral shoots. Thorns may also be pruned off the branches. 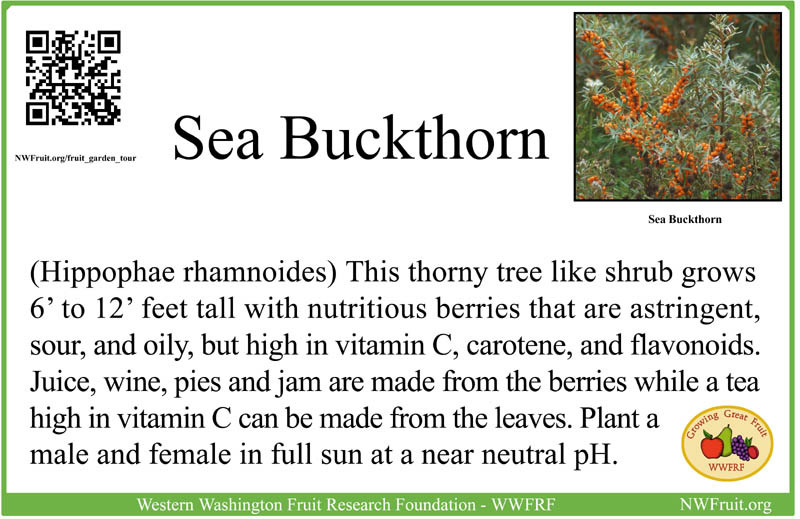 Some recipes for sea buckthorn. The juice is often mixed with sweeter juice from other plants. The berries are high in vitamin E and K, in addition to carotene, flavonoids, minerals and vitamin C.